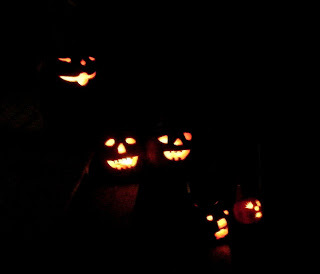 I made a year's worth of pumpkin puree, did a "welcome" display in the front yard and finally, we carved the last few. I've seen enough pumpkins for this year. Maybe enough for next year too. Our pumpkin crop was not good this year--only a few and they rotted at the stem. I really love the amount of fall decorating people are doing these days. 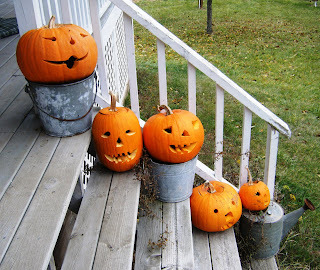 Your Jack o Lanterns are just perfect!